Cisco Unveils Visual Collaboration Solutions in the Post-PC Era, Extending the Reach of TelePresence With New Mobile-to-Immersive Offerings | Marketwired . Powerful tools to extend the reach of TelePresence. Cisco is extending Cisco Jabber to iPad and Windows, building on its extensive Jabber portfolio for Android, iOS, Mac, BlackBerry and Cisco Cius tablets. With this development, Cisco is enabling Jabber customers to collaborate from anywhere and across the most popular operating systems utilizing high definition video, voice, presence, instant messaging, desktop sharing, conferencing and visual voicemail. 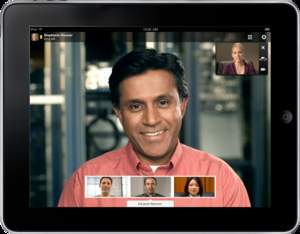 Cisco is also expanding native integration between Jabber and TelePresence, giving mobile users a way to initiate and connect into a TelePresence session whether in the office or on the go. These developments come at a time when people increasingly expect freedom of choice in how and where they work, and that includes having access to a variety of integrated collaboration solutions and interoperable endpoints -- both hardware and software based. As a result, IT managers are looking to provide highly secure, enterprise-class options that enable employees to interact across a broad range of tools whether collaborating in dedicated immersive telepresence rooms or via PCs, Macs, tablets, or smart phones -- and any standards-based endpoint within and between organizations. Significant improvements in ease of partner installation allowing start up in as quickly as two days. A unified client -- meaning an end user has one place to go to be able to access a range of communication and collaboration tools including high-definition video, voice, presence, IM (point to point, group, persistent chat) desktop sharing and web conferencing, and visual voicemail access. "With Cisco's video solutions, disparate groups -- anybody in the organization as well as truly anybody external -- can interact with us face-to-face through TelePresence or using WebEx conference, allowing for more efficient communication and improved collaboration from any location. Cisco Jabber gives the flexibility in the method of communication, starting with presence and IM, extending its reach to a higher level of communication via desktop sharing, conferencing, and TelePresence sessions. With these tools, we are able to provide an in-person experience internally as well as with customers and vendors, saving time and improving customer interaction." "We strive to provide our employees and customers with consistent communications capabilities and a uniform user experience, regardless of what device they are using. 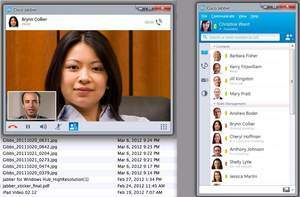 In the coming months, we intend to deploy Cisco Jabber to all our 23,000 bank employees -- on PCs, Cisco Cius, iPhone, iPad, Android, and Blackberry -- to provide them with presence, instant messaging, voice, single number reach to mobile devices, unified messaging, WebEx meetings and TelePresence at their desk and on the go. This Cisco UC client deployment will be part of our 'one vision' initiative for Turkiye Is Bankasi's future where our customers can communicate with their bank using different channels and locations, with the same service level throughout the nation." "We use TelePresence heavily, with two areas especially benefitting by it -- our Turbines R&D department and our people development process. Vestas' Turbines R&D is the world´s biggest research and development department in the wind industry, and we use TelePresence for activities like product development, quality assurance and follow up, thus supporting a faster product to market strategy and a higher quality product. We also use telepresence largely in our People and Culture area: doing job interviews and early Performance and Development Dialogue -- thus saving a lot of cost and time on travelling." "In a world that is increasingly mobile, social, visual and virtual, individuals are dictating how, when and where they communicate and collaborate inside and outside of the workplace. With today's TelePresence and mobility announcements, Cisco is continuing to make 'any device to any device' a reality, while helping customers collaborate on their own terms on a range of devices that provide a rich and consistent user experience."